AS A SPEECHWRITER FOR A U.S. SENATOR, I learned the science of crafting stories. My Dad showed me the art. The process of using storytelling strategically requires tools and methods -- a way to link the historical nature of storytelling to the challenges of the real world. My passion for storytelling involves the creation and re-purposing of these tools to shape, stitch and share stories strategically. These Field Tools are the outcome of my work. You are free to use Field Tools but be cool about attribution. Email us with comments, suggestions or high-fives. Pilots often point to the takeoff and landing as the most critical moments in successfully piloting a plane. Similarly, a story has multiple Takeoffs and Landings which should be mastered and memorized to ensure grace. StoryFlight is a concrete analogy that will help you prepare for the most critical moments of a speech. If your story has three sections (a beginning, middle and end) you will have six sentences to master and memorize. 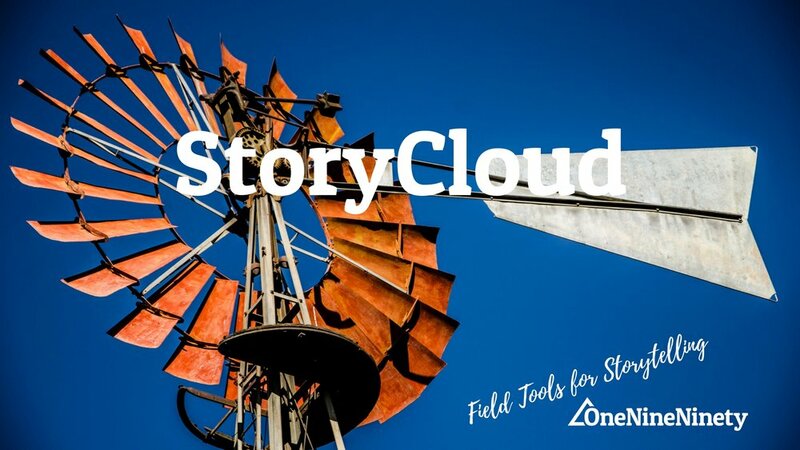 The exact origin of this Field Tool is unknown but I first heard it from public speaking delivery expert, Acacia Duncan, who worked with us on Startup Storytellers. As she coached our storytellers, she would use this analogy to teach our speakers how to deliver their stories. "The hardest part of any talk is getting it going— getting people hooked, and then bringing the talk home, making sure the message comes back and lands." A strategic storyteller is goals-based which requires planning, a fluid process and an ability to manipulate narrative with emotional vignettes and visual infographics. When I first started OneNineNinety, I created long-form storytelling projects like Annual Reports, presentations and white papers. As a visualizer, I could see the end products for these projects and they included far more than linear text. 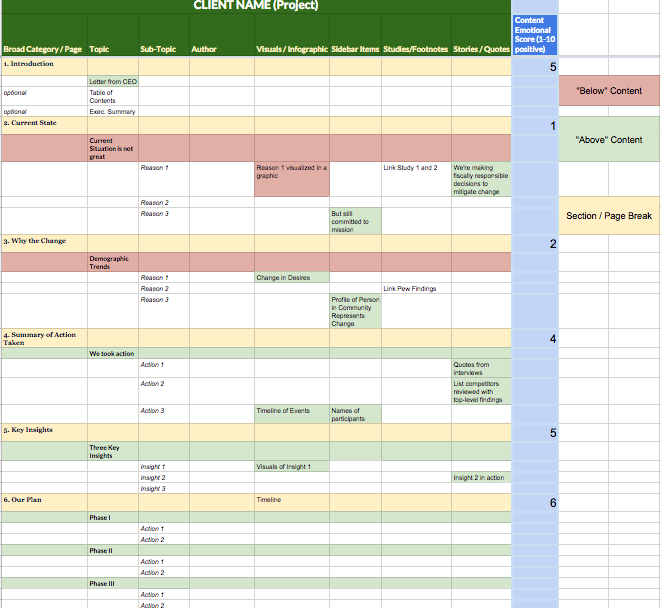 Rather than a Google Doc, I started outlining in a Google Spreadsheet and continue to iterate on the Field Tool. Click here to add a generic version to your Drive. As a visualizer, it's helpful for me toput all of the elements of a long-form strategic story, like an Annual Report, into a spreadsheet. This helps me emotionally balance out 'difficult' content like tough times with signs of success that may not warrant inclusion in a primary narrative. The best stories in the world follow similar narrative patterns and stories. By thinking about the emotions of the reader, you're able to better organize the content for success. Unless you're writing a myth, a true story requires accuracy in themes, language and spirit. We worked with a client with a very meaningful, yet abstract story known throughout the world. We created the StoryCloud method to help them visualize the core themes and found it to be quite simple and effective. Enjoy. Click here to download a PDF of a demo StoryCloud I did with my community. I use a Google Form because it easily captures data in a Spreadsheet. Once you create your form, make sure you check your permissions to allow 'anyone with the link' to participate. Post on Facebook and you're off to the races. Production: I made this final StoryCloud using Canva.com, a freemium design product that makes designing any graphic accessible. Style (photo): Choose a photo which tells your story and gives you enough space to place words telling your story. Style (type): Use one type throughout the entire piece -- consistency aids with storytelling by providing less distracting visuals and subtle style changes (like 'Love' in red and close to my heart) will make a larger impact. As a former speechwriter for a U.S. Senator, I learned the repeatable process of writing a speech: To ensure the objective is met, every detail known and accounted for, etc. It is this process that has led to the creation of our Pitch Deck Checklist that you can download for free. As part of the planning process to write large documents (white papers or presentations), create a Storyshape from your outline to understand the story you're telling, and find ways to tell it better. It's simple, just rate each section of a score of 1-10 on how the reader might feel emotionally based on the content. Then plot.